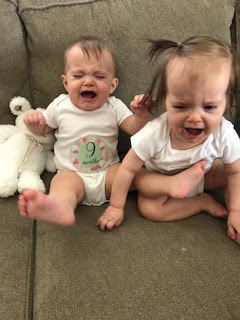 Lucy and Ellory are 9 months! They seem so much bigger now that they are crawling and have 6 teeth. They are the best babies! Ellory is calm and content almost always, but can get pretty mad when she's rarely upset. Lucy is curious, more dramatic, and always on the move. Both are happy and smile and laugh often. Both can crawl with the same ability, but Lucy crawls more. 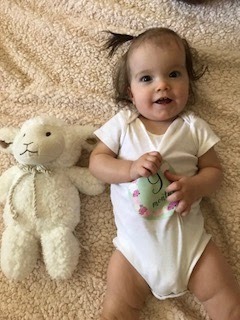 Stats/Doctor visits: Both weren't sleeping very well, so we took them in to check for ear infections on 11/18 (38 weeks), and Ellory had an ear infection in her left ear. 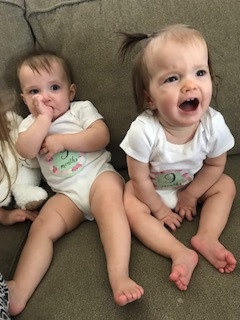 Ellory weighed 17 lbs 14 oz (47%) and Lucy weighed 16 lbs (16%). 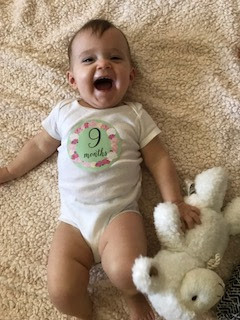 At their 9 month wellness check on 11/22, Ellory was 18 lbs 6 oz (55%), 27.75” (56%), and head circumference was 17.5” (68%). Lucy was 16 lbs 4 oz (18%), 28” (66%), and head circumference was 17.5” (68%). I think the scales are a bit wonky, because the numbers fluctuate because they don't lay completely still so they just pick one in the middle, so it seems crazy that in 4 days between being weighed that Ellory gained 8 oz. Teeth: Ellory got her top left lateral incisor on 10/28, her top right tooth on 11/1 (35 weeks), her top left tooth and top right lateral incisor both on 11/4 (36 weeks), so she had a huge teething week! 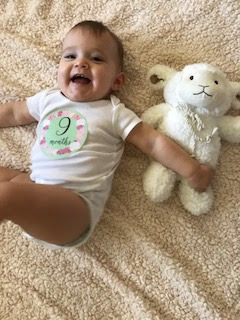 Lucy got her top right lateral incisor on 11/12 and her top left lateral incisor on 11/13 (37 weeks). Feeding: Both are good eaters! Lucy still eats baby food a bit better and Ellory drinks her bottle a bit better, but both are doing well. They have had many foods now. This month they were eating mixtures of apples, pears, bananas, sweet potatoes, carrots, spinach, strawberries, corn, peas, and zucchini. They aren't picky and have eaten it all! They also tried strawberry and banana baby yogurt and liked that too. They have tried puffs, a bit of muffin and mashed potato and handled it okay, but still gag easily. They still nurse at 8, baby food at 11, nurse at 1:45, bottle at 5:30, baby food at 8, and nurse/bottle at 10:30. Diapers/clothes: Wearing size 3 diapers and 9 month clothes (with a few 6-9 month or 6-12 month thrown in). It still fits them well, but I can tell that they are growing because it's not as loose as when they started wearing 9 month. Sleeping: On normal nights, they are awesome sleepers. Yay! They've had a few spouts of night wakings, but that was either when they were teething or had ear infections. Sometimes they would fuss and put themselves back to sleep, but otherwise nursing usually helps and they fall right back to sleep. If someone wakes in the night, it's usually Lucy, but Ellory did too when she had an ear infection. When they are healthy, they sleep all night and it's incredible. They nurse and have a bottle about 10:30 and then go to sleep, and are up at 8ish to nurse again, but they to back to sleep until about 10. They take 2 naps a day, unless they wake up early and then take a short late morning catnap. They take a good afternoon nap from about 2-4:30, and then a short half hour nap about 7:15. 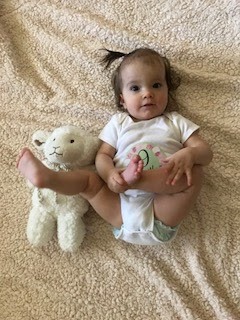 Developments: On 10/25 (34 weeks), Lucy went from laying down to sitting up. The biggest development has been crawling! At 35 weeks, they started actively crawling, and now are pretty quick and can crawl anywhere. Keeps us on our toes! They have the same ability, but Lucy definitely uses it more as she's quite curious. Lucy also pulls herself up to stand frequently now (first time on 10/30 at 35 weeks) and is often found standing! 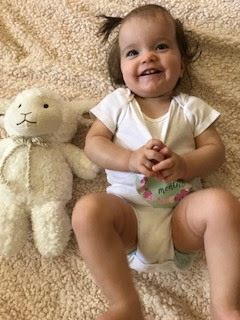 Ellory has only pulled herself up to stand once (11/14 at 37 weeks)- she's just content to sit on the floor with her toys. They are sitting up strong enough that they sit in the tub and they love to splash and play. They laugh and talk to each other and it's the cutest. Ellory pays a bit more attention to Lucy than Lucy does to Ellory. They love to pull out tons of toys from the shelf and put everything in their mouth. Favorites: Lucy's favorites are crawling, pulling herself to stand, baby food, getting into whatever she can get her hands on, trying to get into the bathtub, being held and climbing all over mom and dad. Ellory's favorites are toys, milk, neck tickles, tipping backwards (when being held), baby dolls, splashing in the tub, being held, and sucking her thumb. We love you so much girls! My pictures went a bit crazy. Somehow one of the girls wiped something on the lens and all my pictures of Ellory were blurry and I didn't realize until after. Oops. So this picture would have been adorable. Then Lucy kept grabbing her feet. And the pictures together didn't go so well. Ha. Since the pictures on my big camera didn't go so well, I uploaded the ones from my phone, because those went better! Yes, real life! Sometimes there’s nothing you can do except capture the moment, even if it’s not “cute” and move on! Ha. And yes, they are already getting into so much more, but when they can walk we will have a whole new level of stuff about a foot higher to worry about!